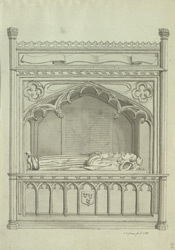 This monument of William Canning and his wife lies in the south transept of the church. Canning was a wealthy, local shipbuilder during the reign of Edward IV (1461-1483). He was also Mayor of Bristol five times. A church has stood on this site since the reign of King Henry I (1100-1135), but the actual construction of St Mary's was begun between 1232-1246. By 1376 it was completed more-or-less as it stood in Grimm's time and as we can see it today. However, the church has undergone many repairs and renovations in its nearly 800 years of existence. In 1446 lightening struck the spire and it collapsed into the nave. The 292 ft spire seen today was added in 1872.